This is the last episode to feature humorous tombstones in the opening sequence (as the camera zooms in towards the Simpsons' house), as the writers had grown tired of coming up with them. The last tombstone shown is one which reads "Amusing Tombstones", an indication that the gag was dead. James Earl Jones voices Maggie in one of the alternate timelines in which Homer lands during "Time and Punishment", his second "Treehouse" appearance on the show, after the initial "Treehouse" episode. This episode features a running gag throughout all three segments, in which Groundskeeper Willie attempts to help someone only to get an ax in the back for his trouble. Offhand, I don't think any of the other Halloween episodes ever used a runner like that, but it's a neat device. Showrunner David Mirkin intentionally tried to make this episode as violent as possible, in response to Congressional complaints and attempts to censor the show (which also motivated Marge's opening warning). "Nightmare Cafeteria" marks David X. Cohen's first work on the show. He would go on to write about a dozen episodes before helping Matt Groening develop Futurama, where Cohen would serve as executive producer and head writer throughout the show's entire run. 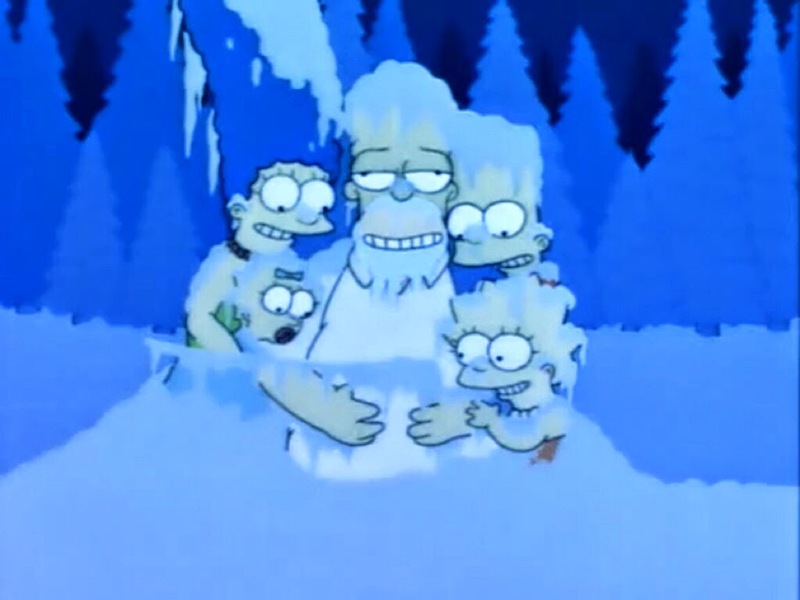 Burns: Yes, by cutting off cable TV and the beer supply, I can ensure an honest winter's work out of those low-lives. Smithers: Sir, did you ever stop to think that maybe it was doing this that caused the previous caretakers to go insane and murder their families? Burns: Hmm...perhaps. Tell you what: we come back and everyone's slaughtered, I owe you a Coke. Marge: Hello, police? This is Marge Simpson. My husband is on a murderous rampage. Over. Wiggum: Well thank God that's over. I was worried there for a second. 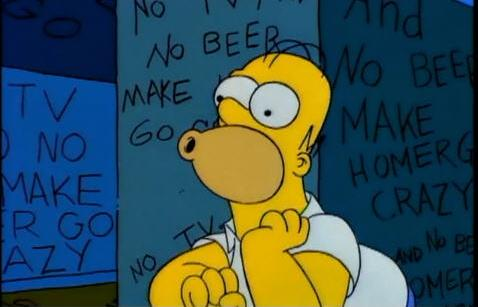 Homer: Television! Teacher, mother, secret lover. Urge to kill...fading...fading...fading -- rising! Fading...fading. Come, family. Sit in the snow with Daddy and let us all bask in television's warm glowing warming glow. 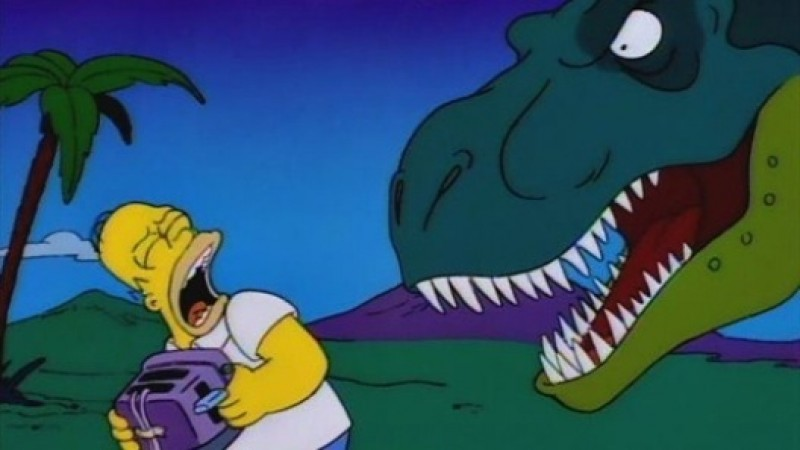 Homer: I've gone back to the time when dinosaurs weren't just confined to zoos! Lisa: Bart, does it strike you as odd that Uter disappeared and suddenly they're serving us this mysterious food called "Uterbraten"? Skinner: Oh, relax, kids, I've got a gut feeling Uter is around here somewhere. After all, isn't there a little Uter in all of us? In fact, you might even say we just ate Uter and he's in our stomachs right now! Wait...scratch that one. 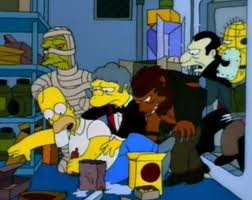 Though not as stacked with all time great stories as, say, "Treehouse of Horror III", this episode has a rightful claim to being the best Simpsons Halloween episode on the strength of "The Shinning" alone, which topped my list of such stories. It is a testament to the Simpsons' knack for parody, as it effectively lampoons The Shining in all of ten minutes, even while nearly every line is a joke or a setup to a joke. The other two segments are strong, though not necessarily at all time great levels. The third one is the weakest, as Bart and Lisa try to avoid being turned into lunch by Principal Skinner, though it's not without its charms and features another strong Halloween outing for Uter (in absentia) following his debut in the previous Halloween episode. The middle segment, featuring Homer and his time machine toaster, is just a couple notches below "The Shinning" and features some strong animation as well an assortment of great gags (like Homer escaping the guard dogs by eating the string of sausages). This episode also an indication of just how firmly Homer's role as the show's central character has become: he effectively stars in two of the three segments, with Bart, the show's former central character, relegated to a third alongside Lisa. Arguably the peak of the show's always-strong Halloween episodes, featuring one of the best all time segments and two more top-notch ones as well. Both the "The Shinning" and "Nightmare Cafeteria" have enough suspense/horror elements to them to keep the spirit alive, though the absence of a framing sequence is felt. I'd put the second story with the Shining segment if only for the raining doughnuts gag. The Uter episode might look a bit weak compared to those 2, but taken on it's own, it's a pretty funny episode. Overall, this is definitely one of the best Halloween episodes. On a personal level, I'd rank with Treehouse of Horror III, but I can understand you ranking it slightly below it. They're both really good episodes. I need to get the DVDs from 1993 to 1997 and have a marathon viewing. My personal favorite halloween episode, not surprisingly based on the Shinning being my favorite segment. I'm personally not crazy about ToH III. @wwk5d: The Uter episode might look a bit weak compared to those 2, but taken on it's own, it's a pretty funny episode. Yeah, we're definitely talking about the difference between "great" and "greatest" here. I recorded a bunch on my DVR when FXX was airing them this last Halloween, but when all is said and done and the show is off the air, I would *love* to have a blu ray set containing all the Halloween eps in one place. @Dobson: I really, really like the evil Krusty doll and King Homer segments in ToH III, which is what places it above this one, even though "The Shinning" is my overall favorite ToH segment. I would rate this episode probably second to my all-time favorite ToH III, which to be honest is only a favorite because Homer Kong (and particularly, Mr. Burns in Homer Kong) is my personal high water mark for the genre. Objectively, I can understand why this might be overall a stronger episode, but nothing will ever make me laugh harder than Al Jolson climbing the Chrysler Building. Not a thing. @Miguel: ToH III is probably my overall favorite, larger on the strength of King Homer. The whole Ape Island exchange between Lenny and Carl cracks me up every time. "I wish we were going to Candy Apple Island..."